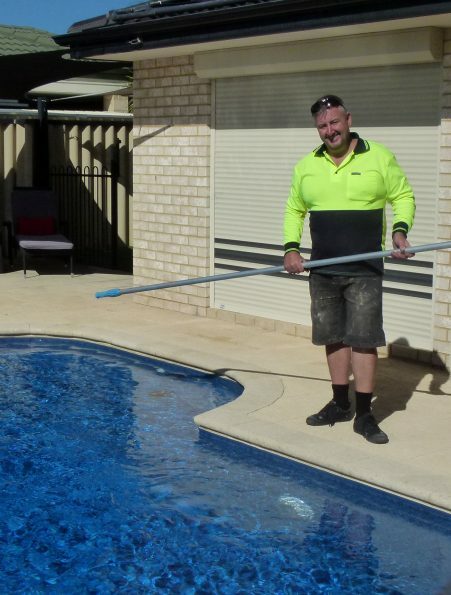 Deluxe Pool Care and Heating are Rockingham, Mandurah & Baldivis’ one-stop-shop for everything related to pool cleaning, equipment service and installations, maintenance and heating. A family-owned and run business, Deluxe Pool Care offers the highest quality service and we individually tailor our services to suit each customer’s needs. A 100% mobile business, we don’t have to cover the overheads associated with running a retail business, so are able to pass these savings onto our customers. Our fully equipped mobile workshop has everything required to efficiently clean and maintain your pool as well as install and service any equipment you require to heat your pool and keep it operating at its best. You’ll be dealing with Steve from the outset and on every visit thereafter, so you can rest assured that unknown tradies will not be accessing your property at any time (aside from Steve’s son who occasionally helps his Dad out in between university classes!). You can trust in the fact that we live in the area ourselves, and that by using Deluxe Pool Care and Heating, you’ll be supporting a local, family owned business. Steve is on the tools whilst his wife, Attie, handles the paperwork. With over 25 years in the pool heating and maintenance industries, Steve is an expert in a vast array of pool heating systems, equipment, repairs and chemicals. We understand that each and every one of our customers has different circumstances, so we tailor our regular cleaning packages to suit your particular pool, needs and budget. You’ll never need to traipse back and forth to your local pool shop for water testing, equipment tweaking and purchase of chemicals. Our fully equipped workshop has everything we need to clean and maintain your pool as well as carry out repairs as required. If we’re not confident in its performance, we won’t sell it. Deluxe Pool Care and Heating carry only the highest quality, mostly Australian-made heaters, equipment, pool covers and chemicals. Formerly a bricklayer, Steve started working in the pool heating industry in 1993 and started Deluxe Pool Heating in 1999. Originally focused only on heating and servicing clients all across Perth, in 2007 Steve made the decision to concentrate on the Rockingham, Mandurah & Baldivis regions so he could offer a more comprehensive, tailored service to his regular clients. At that time, the business became known as Deluxe Pool Care and Heating and Steve is now renowned for offering all the products, equipment and service local property owners require to keep their pools looking and operating at their best. Steve has considerable expertise around many different types of pool heating systems, pool pumps, filters, peripheral equipment, pool covers and chemicals. In his 25 years in the pool industry, Steve has come across hundreds of different issues relating to pools so if you have a specific concern about your pool, chances are Steve has seen it before and can offer a solution. Steve is passionate about delivering the highest quality service and ensuring all his clients get the tailored solutions they need. He takes the time to get to know his customers and their unique circumstances, so he can provide them with the best possible outcomes. He is reliable, trustworthy and always treats his customers and their homes with the utmost respect.